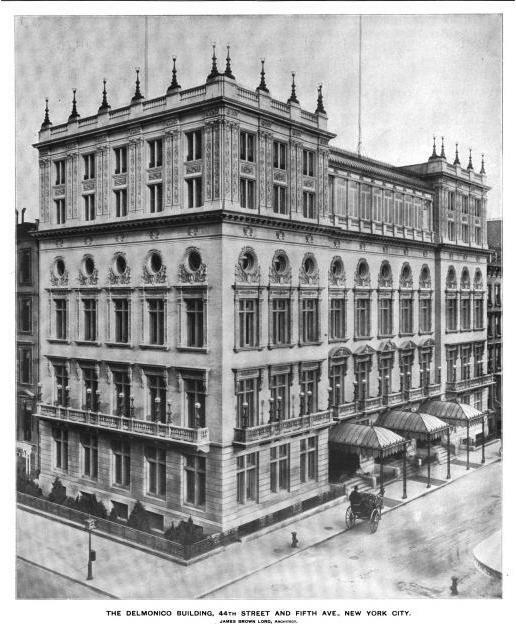 The Delmonico Building designed by James Brown Lord c. 1896 at Fifth Avenue and 44th Street in New York City. 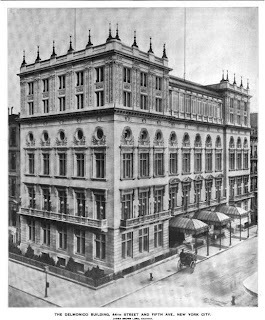 Built for Charles C. Delmonico, the building housed a restaurant and banquet hall and was the largest of all of the Delmonico establishments. The restaurant closed in 1923 and the building was demolished in 1925. Photo from The Brickbuilder, 1899. It was a very handsome building and must have been glorious with all those lights. On November 15, 1897, the new Delmonico's Restaurant on 44th Street opened to universal praise and some shock. In the restaurant, smoking would now be permitted (previously, smoking had been permitted only in the cafe). This change was at the insistence of women, who resented the fact that the men would "retire to the smoking room" after dinner. With this change, women believed that the men would be averse to desert them after dining. Another change and surprise was the addition of an orchestra, which would play "in the background". Previously, listeners were expected to cease movement and to concentrate when an orchestra played, so that they and all could enjoy the music. Now, music would be played while patrons ate and even talked. The new building reflected the Delmonico grandeur with its furnishings and atmosphere. On the first floor, the ladies restaurant overlooked Fifth Avenue. Next to it was the Palm Garden, with plate glass windows reaching from the floor to the ceiling. The cafe and dining rooms on the second floor were richly decorated and had anterooms. The rooms were constructed so that they could all open together for very large parties. On the third floor, the ballroom was lighted (with electric lights, of course), and there were smaller private rooms, including a "bride's room", reserved obviously for the bride at her wedding. Lodgers apartments, servant's rooms and the laundry were on the top two floors. The kitchens were in the basement, and pumps and machinery occupied the subcellar. So just what was "a Delmonico Steak"? "[T]he first boneless top loin steak cut from the front of (anterior to) the short loin." The food mecca of it's day. Beautiful detailed facades and the lighting on the balconies and parapet had to make this building a standout at night. I think Sherry's soon followed by building their new restaurant on the opposite side of 5th Ave, probably setting off a rivalry that lasted until one of the establishments closed their doors. After he shot Stanford White, Harry Thaw had Delmonico's send dinners to his jail cell. So how did Peter and John Delmonico celebrate their success? They moved to Long Island -- or at least to Williamsburg, where in 1834 they acquired a 300 acre farm and built a large stone house. The house itself has been gone for ages -- only a few blocks of gritty "Delmonico Place" remain to mark a portion of their driveway. Many years ago, I was dragooned into being a patron for a small group of musicians who played 18th century French music. Their performances were always held in a great 18th century French room, now comfortably installed in a local museum. The musicians themselves might have been better, but the real problem was always -- "Why are we sitting in stiff chairs listening to music that was meant to be heard as a backdrop to clever conversation?" So when Delmonico's put its players back up on the balcony (so to speak), was it really breaking new ground, or was it just being French?